Acute rhinosinusitis is a very common disease. Although several causes have been described for this condition, it is considered that obstruction of the drainage orifices from the paranasal sinuses to the nostrils is the basic cause in the development of this type of condition, both through the retention of secretions, which promotes bacterial growth, and through decreased oxygen supply, which promotes growth of anaerobic germs. Although a number of treatments have been used for this condition, there a remains a percentage of patients who experience complications caused by rhinosinusitis. In addition, the drugs are also associated with adverse effects. Administration of certain plant extracts activates the physiological cleansing mechanisms, increasing natural secretion within the sinuses and thereby clearing the purulent content accumulated in the sinuses and relieving the symptoms associated with this disease. We present our experience in the use of a plant extract-based product in 28 patients diagnosed with acute purulent rhinosinusitis. Our results support the benefit provided by the use of plant extracts in the drainage of secretions in acute rhinosinusitis. These results have been confirmed in other studies of sinonasal diseases and postoperative care (Zasritskaia et al. 2006; Khechinashvili et al. 2006; Chernisheva & Siniachenko 2006). An appropriate early treatment of the acute rhinosinusitis significantly decreases the need to use antibiotics, which will both reduce costs and the likelihood of side effects (Torralba etal. 2006). Furthermore, studies analyzing the usefulness of antibiotics in acute sinusitis have shown conflicting results, possibly due to the inclusion of patients with viral rhinosinusitis in these studies. Indeed, as some recommendations have pointed out, antibiotics should not be used when a viral aetiology is suspected (mild-moderate rhinosinusitis, lasting less than 7 days, no fever or persistent headache) (Engels et al. 2000; Piccirillo et al. 2004). 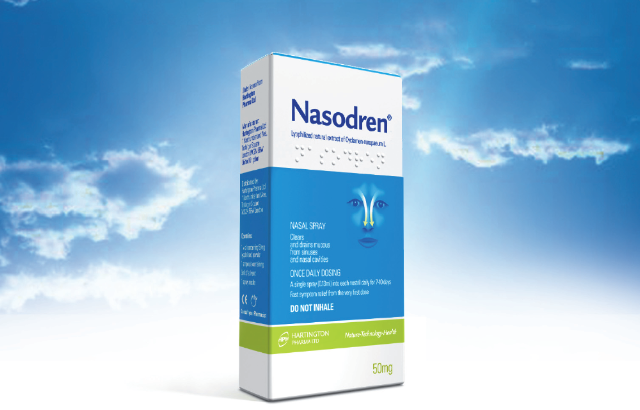 With respect to the patient’s symptoms, including nasal congestion, it is important to facilitate rapid drainage of the mucus secretions retained in the sinuses while at the same time minimising the incidence of side effects. The use of this new plant extract-based product is a significant step forward as it is able to act on the very root of the problem, facilitating rapid and effective drainage of the retained mucus, accompanied by symptom relief in more than 90% of the cases. Furthermore, since it acts locally (it is not absorbed by the tissues and does not enter the bloodstream), there are no major side effects. There may be mild side effects (stinging sensation, sneezing) that do not require stopping treatment. Also, being a natural product and containing no irritants or toxic products, allergy to the product is unlikely to appear. In conclusion, the use of plant extracts provides a rapid, effective and safe alternative. Summary of studies and conclusions.